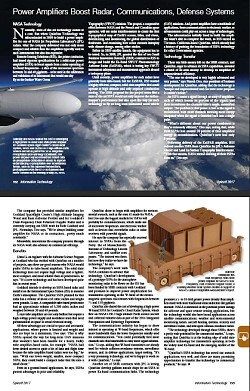 Abstract: As a subcontractor under an SBIR contract from the Jet Propulsion Laboratory, QuinStar Technology Inc. of Torrance, California, developed a solid-state power amplifier of unprecedented efficiency. While most comparable devices lose 20 percent of their amplified energy when their signals recombine, QuinStar's lose 8 percent. The solid-state technology requires lower voltage and is lighter, more compact, and more reliable than its tube-based predecessors, making it ideal for radars, communications equipment on spacecraft, and unmanned aerial vehicles. Page Number in Published book: 152 Manufacturer: QuinStar Technology Inc.
At QuinStar, we know that good decision making depends on good information. We see ourselves as an essential part of the global effort to provide real-time, critical information for the decisions that advance humankind. We see a world of unlimited potential when real-time and critical information is readily available for decision making. Our work supports transformative technologies including autonomous vehicles, satellite communications, environmental sensing, quantum computing development, and the ever-expanding Internet of Things.